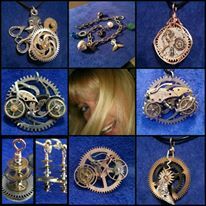 Maker Faire Orlando 2018 – Chaordicwear – Up-cycled, One-of-a-kind, Handmade Jewelry you can Wear everyday! Making Order out of Chaos! What an amazing event!!! We had so much fun. Thank you so much to everyone who bought a piece of their own Chaordicwear. And thank you everyone for all the inspirational compliments. I really really appreciate it. Please keep me in mind for that unique, one of a kind present for the holiday season.